Dana Libby hadn’t been to Galveston, Texas since he was five-years-old and the retired police major couldn’t exactly rely on his memory of the lay of the land to coordinate disaster relief efforts in the wake of Hurricane Ike – especially with much of the city underwater. Galveston was the site of what is often called the worst natural disaster in U.S. history – a massive hurricane in 1900. Ike wasn’t quite as ferocious, but it prompted Mayor Lyda Ann Thomas to call for an evacuation nonetheless. Still, 40 per cent of the island’s residents were either unable or refused to leave. Stranded for nearly two weeks without power, water or sewer services, the situation quickly became a humanitarian crisis. Libby, a volunteer captain with the Salvation Army, relied on mapping and simulation software developed by Everett, Wash.-based Depiction Inc. to plan his strategy to keep Galveston residents alive and well. Libby discussed his experience with Depiction in Galveston at Toronto’s World Conference on Disaster Management. Depiction offers a dynamic geo-spatial mapping environment capable of processing data from many different sources, and that can also make the maps easy to share. It’s proving very valuable to those who must prepare for disaster relief, as well as an educational tool. Depiction models what Toronto would look like if Lake Ontario were to suddenly rise 15 feet. The software concept was born out of Microsoft’s longest running product – Flight Simulator – that was finally cancelled this year after 28 years of updates. Depiction President Mike Geertsen spent 15 years at the Redmond-based software giant, including time as a product planner in the games group that developed Flight Simulator and Train Simulator. But Geertsen had more serious ambitions for Microsoft’s reputed simulation technology: he wanted to develop an application toolkit for use in the enterprise space. Libby didn’t have the luxury of asking “what if?”-type questions when he was deployed to Galveston. He was dealing with reality. Depiction’s ability to pull in data from a variety of sources and format types proved invaluable, he says. The Salvation Army set up shelters, feeding stations, and clean water stations at the local airport after discovering it remained above water and offered a large, open area. The runway proved useful for deploying mobile stations and gathering large groups of people. 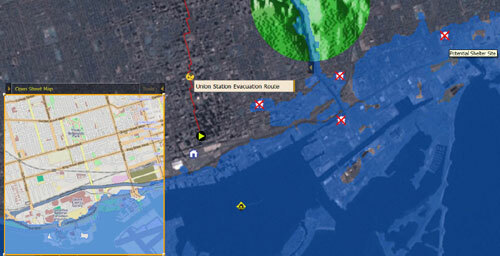 The mapping and simulation software has since become a resource in Libby’s toolkit, and it is one he often recommends to other disaster management professionals. Depiction can pull data down from publicly available information on the Internet or import data from a text source such as a spreadsheet, Geertsen says. A list of GPS coordinates or street addresses can be processed and “geo-coded” for placement on the map to be visualized. The software can be set up to read e-mails sent to a specific address and interpret the locations and events that have occurred, so even field workers without access to Depiction can collaborate to create a map of an unfolding disaster situation. The software is intelligent and responds with adjustments to the map on receiving such input. Depiction can pull data down from the Web. But unlike online consumer mapping applications — such as Google Maps and Microsoft Virtual Earth — it also is able to run entirely as a local application. That’s a boon for reliability in a disaster-affected area where Internet access is spotty at best. The software operates adequately on a low-end notebook computer, the volunteer adds. It is able to share information easily by outputting picture files or HTML that can be posted directly to the Web or social networks. Depiction is also developing a Web viewer for its file format that uses Microsoft Silverlight. It allows users to manipulate a map and view different layers of information that have been exported. An example can be seen in this map of Kandahar, Afghanistan. Depiction is currently available for a promotional price of $89, which expires at the end of July, Libby says. A trial version of the software is also available. Libby appreciates a price like that as a volunteer for a non-profit organization. Libby doesn’t look forward to the next disaster relief situation he’ll face. But when it happens, Depiction will be along for the ride.